Blog - Felling a little nauseous? This year (thanks to the extreme kindness of neighbours, aunties and uncles, grandparents and friends) and due to the fact that my three are now old enough to count, store and trade their eggs with one other, the whole Easter thing took on nightmarish proportions. Whilst I couldn’t say it was exactly wrong, there was something about watching three well fed (let’s face it spoiled) children gorging themselves on a seemingly endless supply of chocolate on Easter morning that didn’t feel quite right. So what to do? Ask people not to give chocolate eggs as gifts and be forever known as the parent who cancelled Easter? 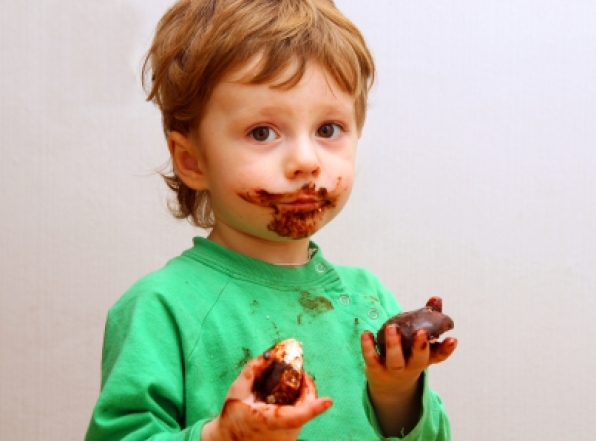 Leave the children to police their own chocolate intake and hope they make sensible choices? Encourage them to give some of their eggs away? Or am I just making a fuss about nothing, after all, kids will be kids? Anyway, it’s three days after Easter Sunday and as there’s no chocolate left in our house you can probably guess that I’ve taken the ‘Eat them all before breakfast if you must but if you make yourself sick it’s your own fault’ stance - not something I’m proud of. In the end, I told myself this would be easier than spending the next three weeks discussing (arguing) when the next chocolate fix would be allowed. It doesn’t make me feel good, in fact, I feel a little nauseous….but isn’t that what Easter is all about?